I just wanted everyone to know how much i love coconuts! and I just love everything about it, the juice and the coconut meat. Oh men, I just love it. The coconut juice taste so clean, did i just say clean? lol! well, what I meant was it's free from artificial stuffs. And I hate myself of always forgetting to blog about it. Coconut juice is the highest natural source of electrolytes , And yes it is much better than just your plain water. Twice in my life I got UTI, Urinary Tract Infection. And so It was really hard for me to pee, It was so painful that I cried, well, I was a kid then, The second time I have had it was when I was pregnant, I think I know some pregnant women has been in this kind of situation. Anyways, My mother would always tell me, Drink coconut juice until you get well, It wasn't really the hardest thing for me. 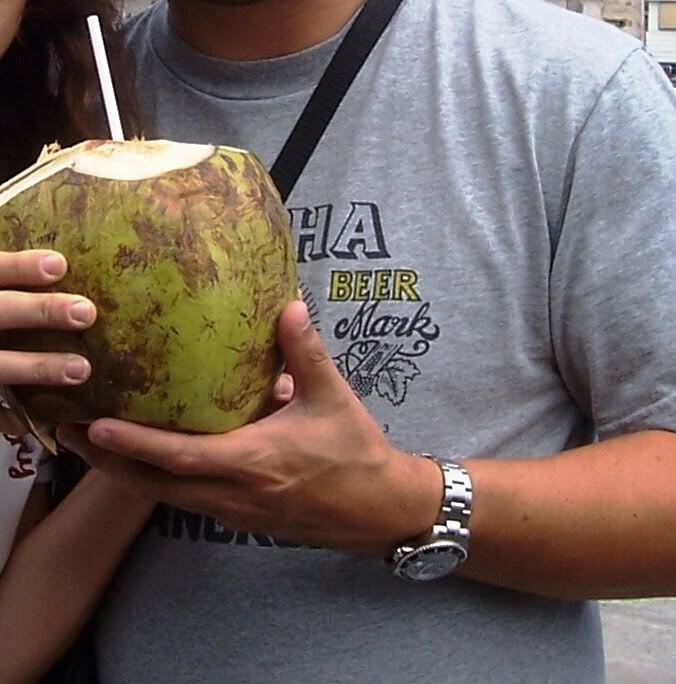 Because I love coconuts. Alright, I religiously drink it, I love it when it's cold Alright so in just a matter of a day or two. I'm OK. Honest! So the coconut juice has this antibacterial thing that kills all those bacteria that causes, throat infections, Urinary Tract Infections, Pneumonia and other diseases. Coconut milk has a lot of vitamins and minerals so My mother would always let my children drink a whole glass of it. It;s good for the skin and hair you know. So this weekend have a coconut juice in the fridge and serve it with ice to your family. Coconut water has a tremendous healing power as far as i know it from my parents.. as when ever i or my brothers used to get sick coconut water was the first thing they made us drink... Health conscious people have incorporated coconut water in their daily routine itself..
Do you guys know that 250ml coconut water contains only 46kcal and for more than 4,000 years, coconut water has been taken as a natural source of nutrition, wellness, beauty and hydration. Coconut water has long been a popular drink. It is immediately changed into energy. It is refresh your mind and it is best drink for summer time.